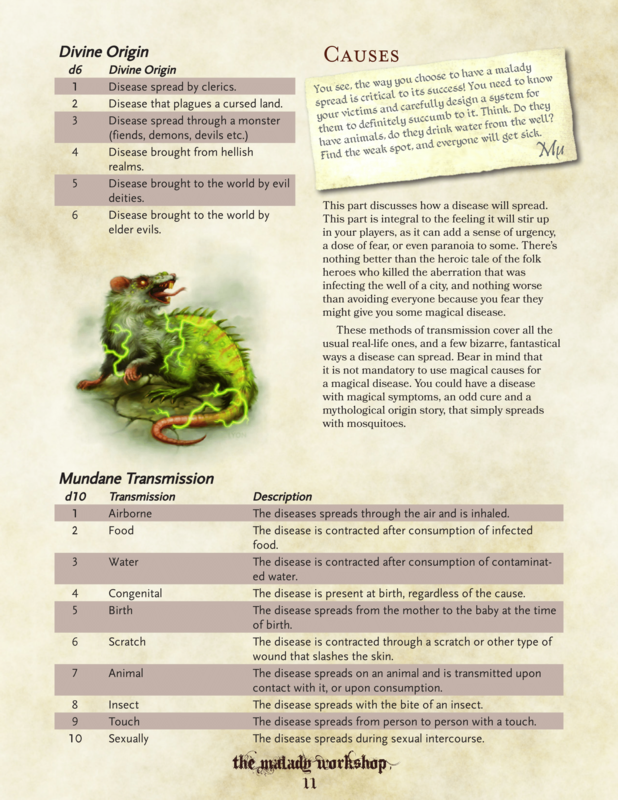 Following the success of the Mithral Bestseller supplement for fantastical diseases, comes the ultimate toolbox to help you create your own evocative diseases. 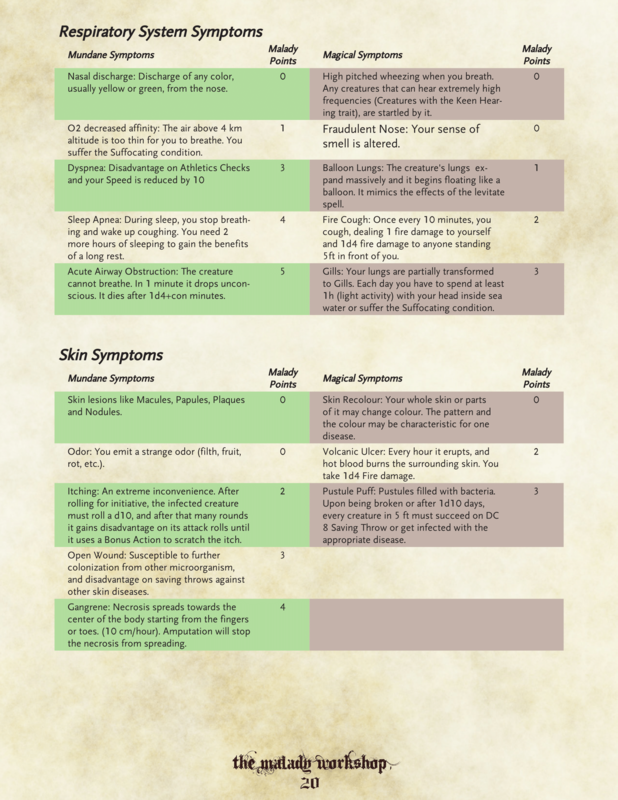 This supplement is written by medical students with a love for tabletop roleplaying games. Inspired by the vast array of diseases, and the medieval myths that once surrounded them, we embarked on a mission; to enrich other worlds with fantastical diseases. Deep in each civilization’s roots, there are myths, remedies, and folklore, all revolving around the ailments that affect its people. When each Dungeon Master wants to expand on the details of the societies that unfold before their very eyes, tools that spice up the process become a vital weapon. This supplement will hopefully become one of them, as DMs create their own diseases, fully fleshed out and based on the grim, epic or mundane conditions of the human body and mind. Do not underestimate diseases. Part of the Dungeon Master’s art is to be able to stir feelings up in their players, and few human conditions could accomplish that better. Used as a way to advance a storyline, to expand a character arc or to create conflict, the stories you can tell with your diseases are infinite! 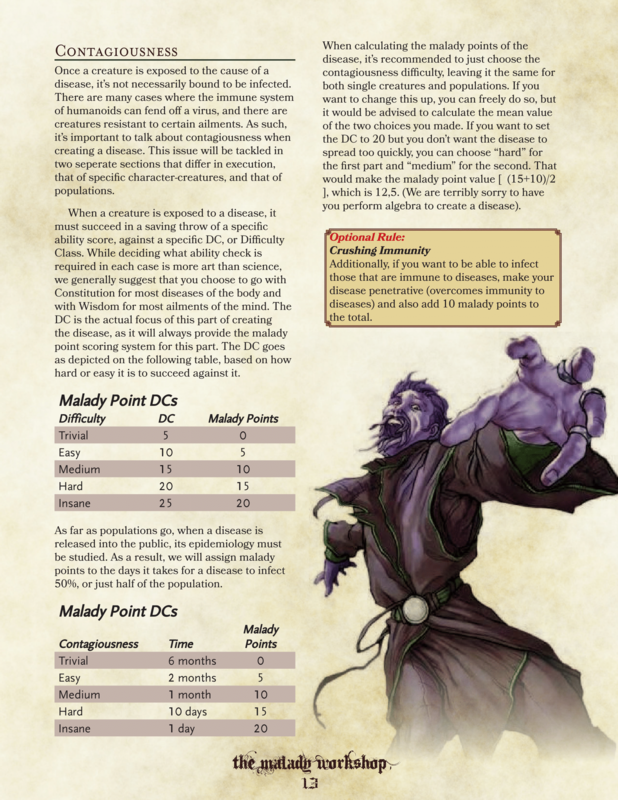 General guidelines that will help you understand how to design maladies best, in order to excite your players and tell better stories. These include its origins, causes, diagnosis, cure, and most importantly, over 80 mundane and magical symptoms to choose from! 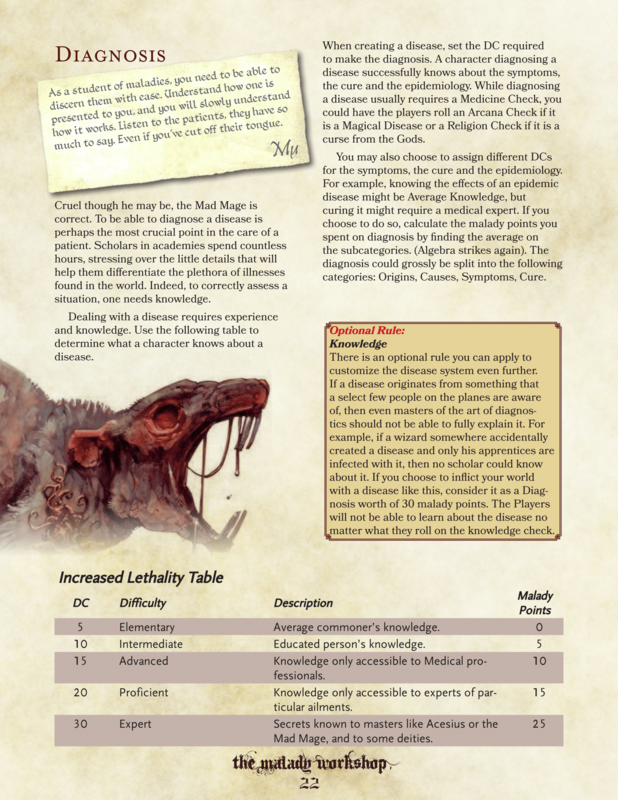 Extensive tables full of ideas to help you decide on the details of each disease. Beautiful art and symbols, designed to assist you in the creation stages, by Phil Beckwith of P. B. Publishing himself! Entertaining notes from the Mad Mage, master of disease crafting and torture, who guides you through his workshop. Give your worlds a touch of fantastical realism and watch as your players dive deep into the stories you create with this toolbox! This book, along with The Malady Codex: The Guide to Diseases, is a Cener Druid's dream come true. Would be a good way to introduce Cener Druids into a campaign setting. How many malady points would you think that paralyzed or petrified? The system provided will help me bring about an idea I've had for a while but this is the only part that falls outside of your presented ruleset. Any chance for Fantasy Grounds? There is some talk going on. If all goes well, there will be a conversion. +1 Fantasy Grounds! TY for such a great resource. 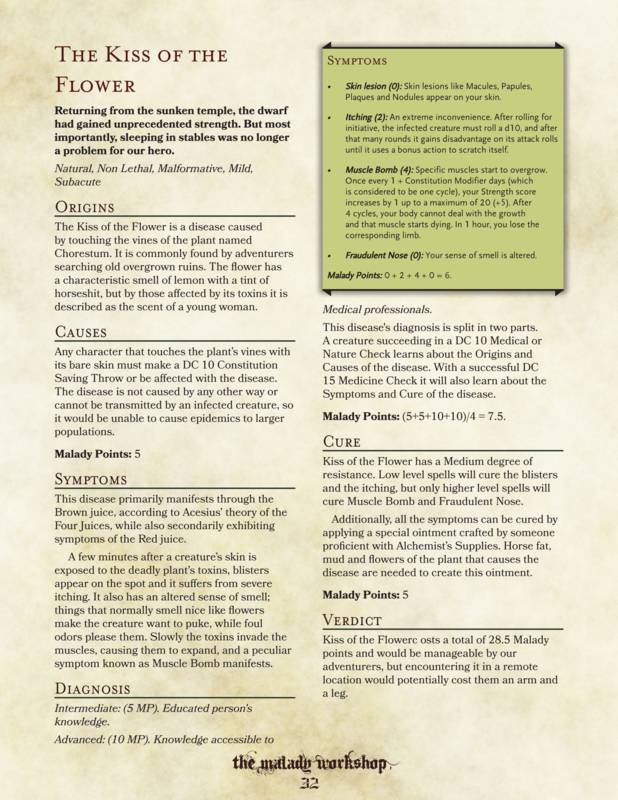 This has now been converted into Fantasy Grounds: https://www.dmsguild.com/product/271597/The-Malady-Workshop-Fantasy-Grounds?affiliate_id=1549348. We have asked the powers that be if there is any chance, but we don't have an answer yet. It is really unclear right now what the conditions are for the Guild and POD. Having said that, we, as the creators, would be really proud to have it as PoD. If we hear back, I'll be sure to let you know. Cheers! I'd love to have one from y'all before I start poking around print shops. Waiting on the Guild to finalize it. It's in the works. Hopefully soon. This title was added to our catalog on January 19, 2019.